Suburbs deserve a better, more resilient future. June Williamson shows that suburbs aren't destined to remain filled with strip malls and excess parking lots; they can be reinvigorated through inventive design. Drawing on award-winning design ideas for revitalizing Long Island, she offers valuable models not only for U.S. suburbs, but also those emerging elsewhere with global urbanization. Williamson argues that suburbia has historically been a site of great experimentation and is currently primed for exciting changes. Today, dead malls, aging office parks, and blighted apartment complexes are being retrofitted into walkable, sustainable communities. Williamson shows how to expand this trend, highlighting promising design strategies and tactics. She provides a broad vision of suburban reform based on the best schemes submitted in Long Island's highly successful "Build a Better Burb" competition. Many of the design ideas and plans operate at a regional scale, tackling systems such as transit, aquifer protection, and power generation. While some seek to fundamentally transform development patterns, others work with existing infrastructure to create mixed-use, shared networks. Designing Suburban Futures offers concrete but visionary strategies to take the sprawl out of suburbia, creating a vibrant, new suburban form. It will be especially useful for urban designers, architects, landscape architects, land use planners, local policymakers and NGOs, citizen activists, students of urban design, planning, architecture, and landscape architecture. "refreshingly realistic about the political landscape." "Designing Suburban Futures is an excellent resource for students in a variety of disciplines...a useful educational resource for planners, architects, landscape architects, developers and politicians...By presenting a variety of strategies which emphasize different components of the retrofit process (environmental, economical, social, ecological) this book offers different perspectives and will hopefully open discussion lines for differing parties to find common approaches." "This is a very graphic book throughout, with a multitude of wide ranging photos, plans, diagrams, montages, renderings and 3D design proposals." "Designing Suburban Futures ... is a concise, pithy, and lucid analysis of how the suburbs came to be and the efforts underway to reform them." "Williamson uses the brevity to her advantage to make the evolution of the suburbs understandable through a clear and concise structure... The book is a slim but important addition to the literature on the American suburb, an important canvas this century." "It's easy to lament the state of suburbia (and many do). What's extremely hard is to develop creative solutions for transformation (which almost no one does well). But that's precisely what June Williamson has done with this terrific book. With this guide, a seemingly insurmountable challenge now feels like an opportunity." "In the next decades, cities worldwide will have to adapt to rapidly changing environmental and social conditions and low-density suburbs will need to radically transform. Through a unique analysis intertwined with history, Designing Suburban Futures shows us how this can be done. It is an important read for anyone who is serious about understanding and changing current development practice." "Suburbia may be paved with good intentions, but its manifold costs are now as well known as its endless cul-de-sacs and malls. This well-crafted book shows how sprawl's seemingly indelible imprint on America can be embroidered and re-jiggered into more resilient, livable places." "What used to be called the crisis of the city has moved to the suburbs. In response, June Williamson's call to action is both prescient and grounded in expert knowledge. Designing Suburban Futures cuts into stereotypes with a scalpel, and makes its urgent case for the fresh interaction of design, policy, and practice with equal parts elegance, erudition, and respect." "Excellent color illustrations show how to design better suburbs, without trying to make them into Manhattan. A great design resource!" 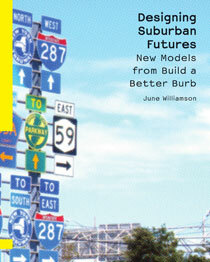 "...worth a read, especially for those who want to get a good introduction to the issues around suburban development." "...rich integration of text and figures, Designing Suburban Futures is an eye-candy feast, with color images everywhere the reader looks."